Activity resources will be covered on the PMP Certification Exam. Your team members will provide the expertise needed to determine the types and amounts of resources you will need. For projects that include new or emerging technology, or where your organization has a lack of experience, you will want to brainstorm alternative approaches. This can include finding new ways of doing something, determining the best mix of resources and skill sets, procuring skills or deliverables versus developing them inhouse, and similar types of alternative analysis. In some cases, the information on the work package or activities is at too high of a level to be able to estimate the resources accurately. In this case, you will have to decompose it further to get a bottom-up estimate. 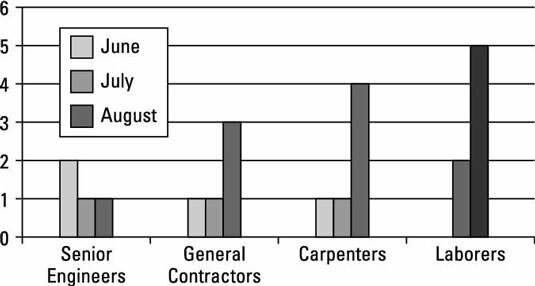 Some industries, such as construction, have published unit costs for trades, material, equipment, and geography. The published rates are great for an initial estimate. However, you will want to use your knowledge and expertise to refine the estimate for your particular circumstances. Activity Resource Requirements. The types and quantities of resources required for each activity in a work package. Activity resource requirements include the type, number, and skill level of the needed resources. It’s useful to include the assumptions that led to the estimates and the basis of estimates. provide oversight to lower-level contractors. basic to complex sites with little oversight and rework. the use of all tools required on-site but are not craftsmen. 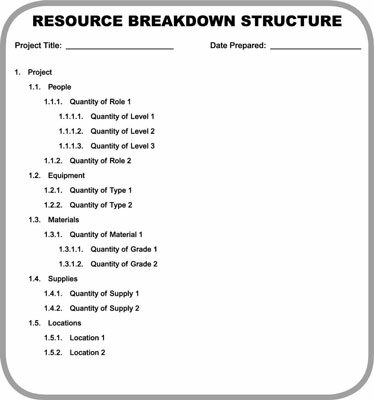 In projects with a large number of resources, organizing resources by using a resource breakdown structure can be helpful. A resource breakdown structure is organized like a work breakdown structure, but it uses categories of resources to organize information. Resource breakdown structure. A hierarchical representation of resources by category and type. Another way to display resource requirements is a resource histogram. Resource histogram. A bar chart showing the amount of time that a resource is scheduled to work over a series of time periods. Resource availability may be depicted as a line for comparison purposes. Contrasting bars may show actual amounts of resources used as the project progresses. Here are two examples. 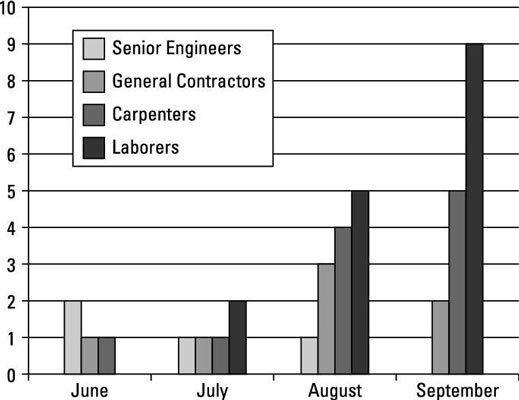 This shows a resource histogram that shows the skill set needed and the months they are needed. This shows the months and the skills needed by month. Both show the same information but are formatted in different ways. There is no set way to present the information; decide what works best for you. Information from this process can be used to elaborate the activity attributes you first developed when defining activities and to update resource calendars.